1. Boil the peas for 2 minutes. Drain and run under cold water; drain again and set aside. 2. Toss the bread with the oil, then fry over a medium heat for 3-4 minutes, stirring, until golden. Drain on kitchen paper. 3. Whisk the lemon zest and juice with the crème fraîche. Season, then add the herbs. 4. 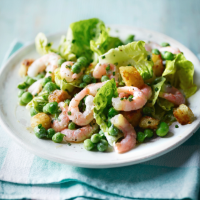 Tear the lettuce leaves in half and put in a mixing bowl with the prawns, croutons and ⅔of the peas. Toss with the dressing and divide between 4 plates. Season, scatter over the remaining peas and finish with another splash of olive oil.